This one is a cutie and has space for easy personalization. It's a quickie gift that will last a lifetime.The colors are easy to tweak for girls or boys. Just change the colors on the baby booties. 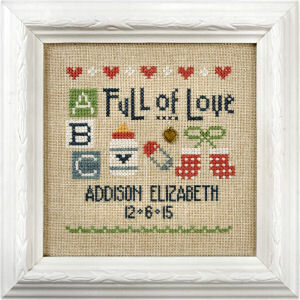 Includes 28 ct. Lambswool linen, alphabet and numbers for personalization and antique gold heart charm.